Tempeh is fermented soy a bit like tofu and just like tofu, it is a flavour carrier. Seasoning the Temper in jerk seasoning is one of the perfect ways to enjoy the jerk flavours as a vegan. Alongside the rest of the ingredients in this salad that would be found in Jamaica and the rest of the Caribbean. 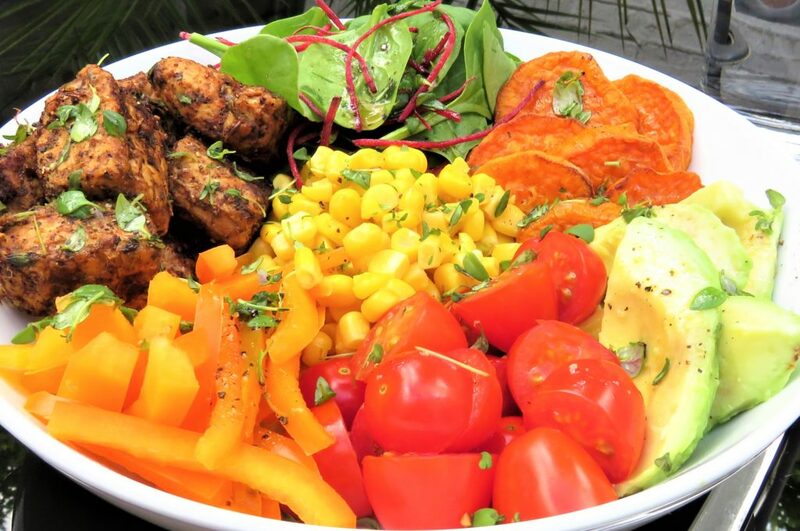 With a cooking time of 15 minutes, this salad is tropical heaven in a bowl. 1 Rub the jerk seasoning onto the tempeh until it completely covered in the seasoning, then set aside. 2 Place the sweet potato on a tray and spray both sides of the sweet potato with oil, then place the tray in a pre-heated oven on 200c/400c/gas 7 for 15 mins turning halfway through. When cooked set aside to cool. 3 Give a cold frying pan 3 sprays of oil then place on a medium heat, when heated add the tempeh and spray with 3 sprays of oil. Cook the tempeh on all sides until it has a little colour and the seasoning has been cooked. This will take about 3 – 5 minutes when cooked set aside. 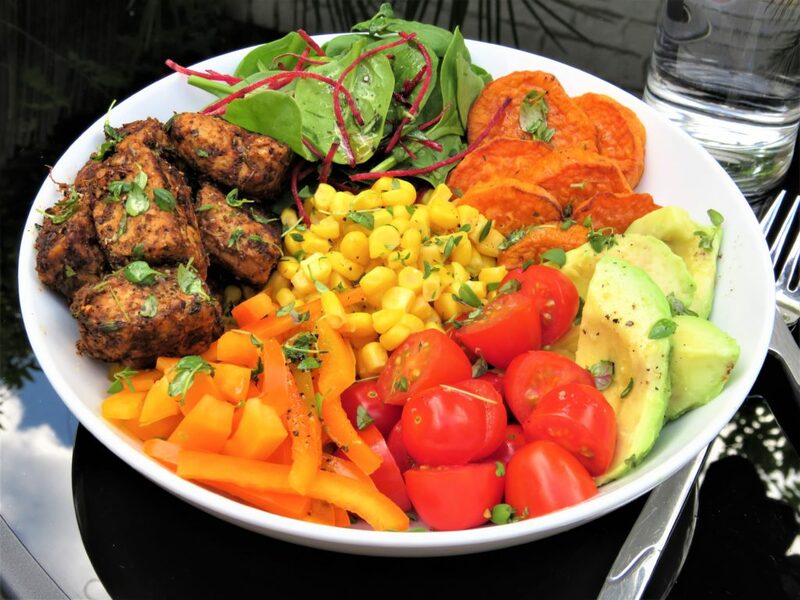 4 Then start to plate up adding the bistro salad in the bowl followed by the sweet potato, avocado, tomatoes, orange pepper, jerk tempeh and sweetcorn. 5 Place all the ingredients for the dressing in a jar with the lid on give it a shake or mix in a jug, then pour the dressing over the salad. 6 Then enjoy and let the flavours transport you. Yum! Tempeh is a traditional soy product originating from Indonesia. It is made by natural culturing and controlled fermentation that binds soybeans into a cake. It contains probiotics, eating fermented and probiotic foods have many health benefits – it reduces cholesterol, increases bone density, reduces menopausal symptoms, provides muscle building protein, contains diabetes, helps fight against cancer and other inflammatory diseases. 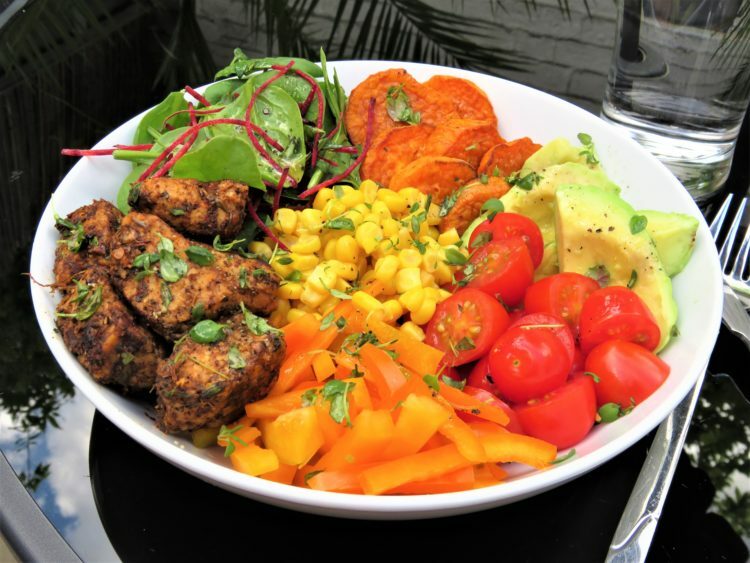 Tempeh also contains manganese, copper, fibre, phosphorus, vitamin B-2 and magnesium – all more absorbable by the body because of the fermentation process. Avocados are nutrient-dense and contain nearly 20 vitamins and minerals. They are high in fibre, potassium, and copper. They are also rich in vitamin-B, vitamin B-9, vitamin-C, vitamin-E and vitamin-K. They have a low GI, are low in sugar and saturated fats, they also do not contain any cholesterol or sodium. These are what makes avocados a super food. Lime Juice not only does it cleanse the body of toxins and radiation, it is well known for its antioxidants and anti-inflammatory benefits, it helps strengthen the immune system. It is also rich in vitamin-C which has anti-cancer properties when drizzled on the rocket or leafy greens it helps our body absorb the iron. Sweet corn is high in dietary fibre, ferulic acid, B-complex vitamins, copper, manganese, iron, magnesium and zinc. Baby Spinach low in calorie its high in iron and anti-oxidants like vitamin-A, vitamin-C, vitamin-K, B-complex, niacin and omega-3 fatty acids. Got my food facts, thank you..my menu is sorted!